5% cashback on ALL purchases (including overseas expenditure) for the first 3 months capped at $5,000 (max $250 cashback). My application for this card was very timely as it came just in time for my Japan trip. Before traveling, I called the very friendly customer care and re-confirmed that overseas purchases are eligible for the cashback. I swiped a lot of purchases when I was in Japan and I ended up paying lesser than my lucky plaza money changer exchange rate due to the 5% cashback. Came back to Singapore and continued the spending spree like crazy and I think I almost hit the cap at $4.8k expenditure. (Do note that the cashback is NOT $5,000/month for 3 months; it is $5,000 max for all 3 months.) Another good thing about Amex is that their 5% cashback is deducted in the same billing month as your expenditure. This means you only pay for 95% of your purchases in those three months. Simply put, it’s a free $250 for you to “earn”. You can remove the card from your wallet after the first 3 months and cancel the card 9 months later when they charge you the annual fee. *DO NOTE THAT YOU WILL HAVE TO HIT A MINIMUM OF $600 ON CREDIT CARD EXPENDITURE EVERY MONTH otherwise you will only get a 0.3% rebate and not the 3% & 6%. Cashback amount is capped at $80/month (Haven’t exceeded the amount yet. So far only hit $25.11, $45.94) Do note that cashback amount is only reflected in the following month’s statement. Most people will pair the card with their OCBC 360 account to earn the alot-of-strings-attached (yearly) interest rate for the 1st $60,000 in your account. 1% per year base on the incremental value (up to $1,000,000) of the difference of daily average balance. 0.05% per year on the entire account for Base Interest. *FINE PRINT WHICH MOST PEOPLE DON’T NOTICE: Minimum Average Balance for the month must be above $3,000, otherwise there will be a $2 admin fee deducted. This charge is waived for the 1st year. Definitely a very scheming fine print as the minimum account balance for most banks is $500.. Although the dining rebates for local dining is higher for POSB everyday card, I was not confident of spending that extra $500 on top of the $600 for OCBC 365 credit card. My bigger purchases are online shopping and this category is not covered for POSB everyday card. Furthermore, OCBC 365 has greater benefit in earning 0.5% more interest.. So in this case, OCBC 365 card wins hands down while my POSB Everyday card is solely used for SPC fuel and eZ reload and the bill hovers around $100-200 each month. Do note that when I signed up roughly a year or two ago, there was a free $80 rebate on first spend. That’s like $80 free shopping the moment you get the card. The current welcome gift is $120 Starbucks card or a Samsonite luggage. 8% cashback on petrol/dining is very attractive but when you read the fine prints, you will see that a minimum spend of $888 is required every month. 5% rebate on chosen category (dining/leisure, travel, shopping, groceries) – like seriously.. I have to choose my own category for my rebate? Anyway, that’s besides the point; the minimum income requirement is $80,000 per annum and I’m no where near that. However, if you do qualify, there’s a $100 cash rebate with a new sign up. This card used to be the card for online shopping but they’ve recently changed their fine prints. You need to hit a minimum spend of $400 (exclusive of online shopping). So that’s spending $400 on entertainment (5% for fri-sun) and other stuff and you will get the 6% rebate base solely on online spending. Anyway, it’s almost impossible for me to hit $400 exclusive of online shopping. So this highly raved card has been sidelined by its own brother – the 365 card. Furthermore, the cashback is capped at $60 while 365 is capped at $80. Another not competitive card in the market to confuse me. They proclaim to be the “Most Generous Rebate Card refers to the highest cash rebate of 5% based on a spend amount of $2,000 per month for 3 consecutive months”. Definitely a card not for the masses. I don’t think people who spends at least $2,000 on credit card every month bothers about cashback. Anyway, my friend did mention that you can still can receive a 3.33% cashback if you hit minimum $500 spending. However, do note that you have to meet this $500 for all 3 months every quarter in order to receive that cashback. This means that if you happen to not hit the minimum spend for a month, you will lose the eligibility for ALL cashback. Why risk it? OCBC’s 360 cashback doesn’t have this inflexibility. Furthermore, their “high” interest rate of 3.33% is only valid after the first $30,000 in your account, for the next $20,000. Simply put, this card is not (to me) attractive at all; despite its frequent advertising on Straits Times. I think that’s all I have on credit cards. 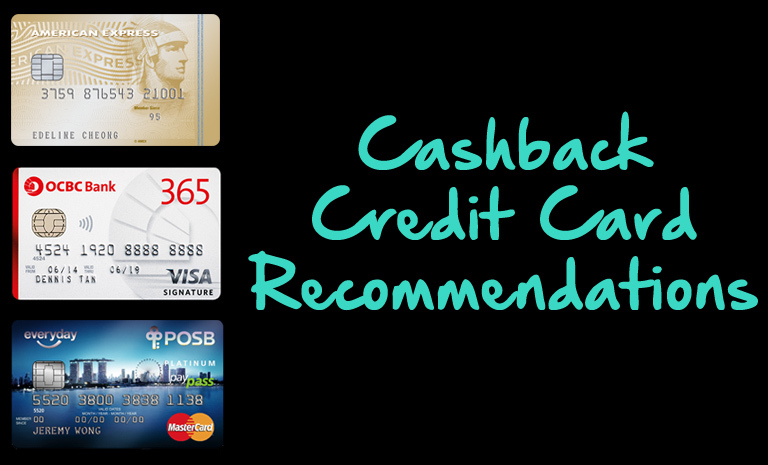 Do share with me your experience and opinions on your must-have credit card too!